Play of the Day: Is The White House Altering Social Media Photos of the President? Trump trans­ition of­fi­cials will not talk about the is­sue, not even re­spond­ing to ques­tions on wheth­er they have had any dis­cus­sions with the NSA. The pres­id­ent-elect, in an in­ter­view with CBS’s 60 Minutes shortly after the elec­tion, prom­ised to be “very re­strained” with Twit­ter “if I use it at all.” With 17.3 mil­lion fol­low­ers, he sees Twit­ter as “a meth­od of fight­ing back” against cri­ti­cism. That means the NSA, which is in charge of pro­tect­ing U.S. gov­ern­ment com­mu­nic­a­tions and in­form­a­tion sys­tems, will have to deal with a tweet-happy pres­id­ent, one who has told his aides he does not want to sur­render his Sam­sung Galaxy S4. It’s ex­actly the type of chal­lenge George thrived on dur­ing his 41 years with the NSA. Be­fore he re­tired in 2011 and be­came seni­or ad­viser for cy­ber­se­cur­ity at the Johns Hop­kins Ap­plied Phys­ics Lab, George had spent the pre­vi­ous eight years at the NSA as tech­nic­al dir­ect­or for the In­form­a­tion As­sur­ance Dir­ect­or­ate. He was in that job on Elec­tion Day in 2008 when he was told to find a way to let Obama keep his Black­Berry. In an in­ter­view this week with Na­tion­al Journ­al, George com­pared the as­sign­ment to the NSA’s de­vel­op­ment of “Vin­son,” a se­cure voice-en­cryp­tion unit that was a fore­run­ner of the cell phone. “We de­signed that in 1957. We built the first mod­el in 1970, and we fixed everything we found wrong through the first few en­gin­eer­ing mod­els, and we fielded it in 1976. It took 19 years to get that thing out,” he said, con­trast­ing that with the three-month time frame to reen­gin­eer Obama’s phone. To do it, he as­sembled a core team of about a dozen, with up to an­oth­er 50 work­ing on the pro­ject. In the end, after tweak­ing the phone’s al­gorithms and en­gin­eer­ing, he presen­ted the new pres­id­ent with a severely lim­ited device. Obama could call and re­ceive calls from only a hand­ful of close friends—who first had to be briefed by the White House coun­sel’s of­fice and have their devices ex­amined. He could not click on any at­tach­ments and could not tweet. “And he wasn’t play­ing Angry Birds, I can prom­ise you that,” joked George. In Obama’s last year in of­fice, the NSA re­placed his Black­Berry with a new phone. The lim­it­a­tions re­mained in force, as the pres­id­ent joked in an ap­pear­ance on The To­night Show with Jimmy Fal­lon on June 9. Obama re­called what he was told when giv­en the new device: “This is a great phone—state of the art. But it doesn’t take pic­tures, you can’t text, the phone doesn’t work, and you can’t play your mu­sic on it,” he joked. If a pres­id­ent is not care­ful, he could sur­render con­trol of his phone, his cam­era, and the device’s mi­cro­phone and GPS. “People are go­ing to try a lot harder, spend a lot more re­sources to get him. You’ve got to pro­tect your­self,” said George. For Trump, George sus­pects the an­swer will be giv­ing him mul­tiple devices. “It’s not like he is only go­ing to have one device to do things from. And it’s not like he has to worry about car­ry­ing ex­tra devices. There are people who will be car­ry­ing stuff for him.” George said the func­tion­al­ity of one device can be lim­ited to send­ing tweets. “This is the device that you only Twit­ter on. You don’t take phone calls, you don’t send emails. 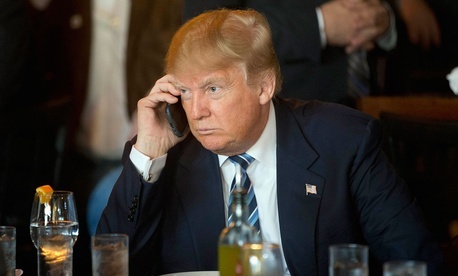 You Twit­ter on this and nobody is call­ing you on this.” An­oth­er phone would be used for calls to his fam­ily.